Shab-e Chella(-ye bozorg) ("night of (the great) forty", Persian: شب چلّه‎‎) or Shab-e Yaldā ("Yalda night" Persian: شب یلدا‎‎) is an Iranian festival celebrated on the "longest and darkest night of the year, that is, in the night of the Northern Hemisphere's winter solstice. Calendarically, this corresponds to the night of December 20/21 (±1) in the Gregorian calendar, and to the night between the last day of the ninth month (Azar) and the first day of the tenth month (Dae) of the Iranian civil calendar. The original Avestan and Old-Persian term for the celebration is unknown, but it is believed that in Parthian-Pahlavi and Sasanian-Pahlavi (Middle-Persian) it was known as Zāyishn (zāyīšn-i mithr/mihr – birth of Mithra). 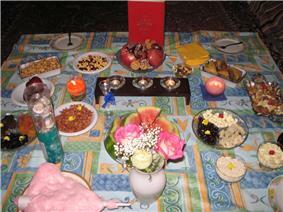 The New Persian "Shab-e Cheleh Festival" is a relatively recent term. The celebration emerged on the Iranian plateau by the Aryans (Iranians) around middle of the 2nd millenniums BCE, but the original date of celebration could be reach as far as pre-Zoroastrian era, around 3rd to 4th millennium BCE. 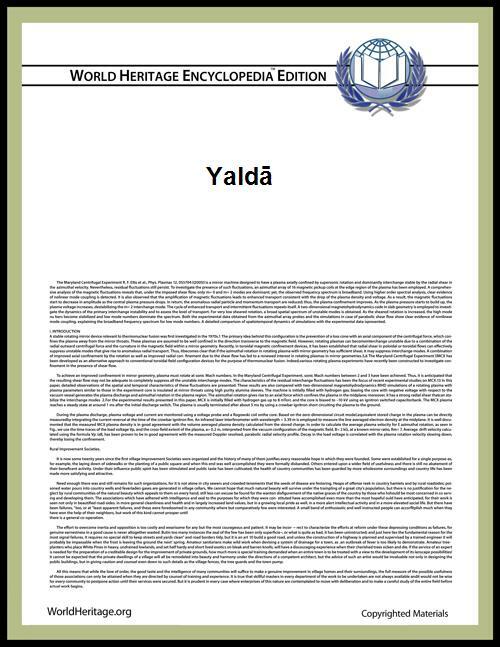 Yalda is a Syriac word meaning birth (NPer. milād is from the same origin) in the 3rd century CE, Mithra-worshippers adopted and used the term 'yalda' specifically with reference to the birth of Mithra. It is not clear when and how the word, entered to the Persian language. The massive persecution of early Christians in Rome which brought many Christian refugees into the Sasanian Empire and it is claimed that these Christians re-introduced and popularised "Yalda" in Iran. Gradually "Shab-e Yalda" and "Shab-e Cheleh" became synonymous and the two are used interchangeably. In Ancient Iran, the start of the solar year has been marked to celebrate the victory of light over darkness and the renewal of the Sun. The last day of the Iranian month of "Āzar" (21 December) is the longest night of the year, when the forces of Ahriman (darkness) are assumed to be at their peak. While the next day, the first day of the month of "Dey" known as "Khorram rūz" or "Khur rūz" (the day of the sun, 22 December) symbolises the creator, Ahura Mazda (the Lord of Wisdom). Since the days are getting longer and the nights shorter, this day marks the victory of the sun over darkness, and goodness over evil. The occasion was celebrated in the festival of "Deygān" dedicated to Ahura Mazda, on the first day of the month of "Dey" (December–January). 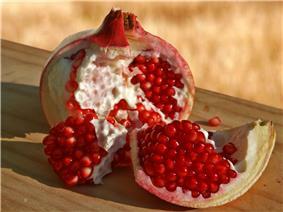 Pomegranate is necessary for Yalda. 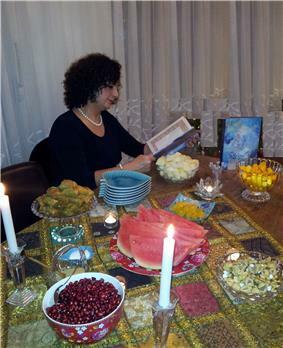 Yalda is a time when friends and family gather together to eat, drink and read poetry (especially Hafez) until well after midnight. Fruits and nuts are eaten and pomegranates and watermelons are particularly significant. The red color in these fruits symbolizes the crimson hues of dawn and glow of life. The poems of Divan-e-Hafez, which can be found in the bookcases of most Iranians families, are intermingled with peoples' life and are read or recited during various occasions like this festival and at Nowruz. The longest and darkest night of the year marks "the night opening the initial forty-day period of the three-month winter", from which the name Chella, "forty", derives. There are all together three 40-day periods, one in summer, and two in winter. The two winter periods are known as the "great chella" period, 40 full days, followed/overlapped by the "small chella" period (10 Bahman to 30 Bahman, 20 days + 20 nights = 40 nights and days). Shab-e Chella is the night opening the "big chella" period, that is the night between the last day of autumn and the first day of winter. The other name of the festival, 'Yaldā', is a borrowing from Syriac and is "connected with Christianity". In the 1st-3rd centuries, significant numbers of Eastern Christians settled in Arsacid and Sassanid territories, where they had received protection from religious persecution. Through them, Western Iranians (i.e. Parthians, Persians etc.) came in contact with Christian religious observances, including, it seems, Nestorian Christian Yalda, which in Syriac (a Middle Aramaic dialect) literally means "birth" but was also one of the Syriac words for Christmas, which—because it fell nine months after Annunciation—was celebrated on eve of the winter solstice. Although it is not clear when and where the Syriac word was adopted into Persian, gradually 'Shab-e Yalda' and 'Shab-e Cheleh' became synonymous and the two are used interchangeably. Fires would be burnt all night to ensure the defeat of the forces of Ahriman. There would be feasts, acts of charity and a number of Zoroastrian deities honoured and prayers performed to ensure the total victory of the sun that was essential for the protection of winter crops. There would be prayers to God Mithra (Mithr/Mihr/Mehr) and feasts in his honour, since Mithra is an īzad (av. Yazata) and responsible for protecting "the light of the early morning", known as "Hāvangāh". It was also believed that Ahura Mazda would grant people's wishes in that day. With the spread of Christianity, Christmas celebration became the most important Christian festival. In the third century various dates, from December to April, were celebrated by Christians as Christmas. January 6, was the most favoured day because it was thought to be Jesus's Baptismal day (in the Greek Orthodox Church this continues to be the day to celebrate Christmas). In year 350, December 25 it was adopted in Rome and gradually almost the entire Christian church agreed to that date, which coincided, with the Winter solstice and the festivals, Sol Invicta and Saturnalia. Many of the rituals and traditions of the pre-Christian festivals were incorporated into the Christmas celebration and are still observed to this date. An association with the 40-day "chella" period is preserved amongst Iranian Azerbaijanis, who call it Chilla Gejasi, which means the beginning of the first 40 days of winter. The Iranian concept also survives in Kashmir, where Chillai Kalan designates the 40-day harshest winter period. With the conquest of Islam the religious significance of the ancient Iranian festivals was lost. 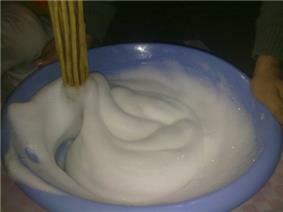 Today "Shab-e Cheleh" is merely a social occasion, when family and friends get together for fun and merriment. Different kinds of dried fruits, nuts, seeds and fresh winter fruits are consumed. The presence of dried and fresh fruits is reminiscence of the ancient feasts to celebrate and pray to the ancient deities to ensure the protection of the winter crops. Shab-e Chella was officially added to Iran's List of National Treasures in a special ceremony in 2008.